What's new in Spring 2019? Hello, fiends! I'll be starting a new storyboard job this month, so I won't be able to take commissions until mid-June. If you still want to see new artwork and amusing material, just follow along the Facebook group or consider throwing in a buck to my Patreon page, where you can participate in our bizarre Drawing Requests every month! 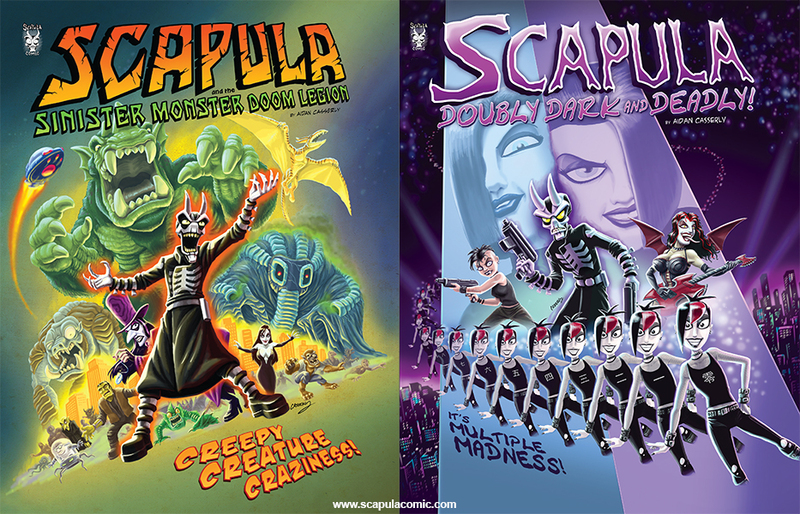 For those of you who didn't participate in the Kickstarter last fall for some bizarre reason, Scapula: Doubly Dark & Deadly! is now available for sale in a creepy convenient comic pack with Scapula and the Sinister Monster Doom Legion. You can read more about it or order it for yourself in the Scapula Store! More news is coming up soon, so please check back for updates or follow me along on Facebook for daily art and lunacy! SCAPULA, The World's Worst Villain! Read more about my caricature services and convention schedule. Interested in commissioning my services for your custom project or hiring artists/animators? For freelance work, please read more about my artistic services here. Follow Aidan all across the web! © 2019 Aidan Casserly. All rights reserved. No part of this site, incluing all artwork and content, may be reproduced without prior consent of the author/artist.